Today is a huge day for Apple, having launched a range of new iPads, and two special edition iPhones. One piece of news that will inevitably be overshadowed as a result is that the company has announcedits first ever video sharing app, called Clips. Clips, which was first announced last summer, is almost like the unholy lovechild of Snapchat, Instagram, Vine, Prisma, and iMovie. It exists entirely separate from the current Apple Camera application, available for the iPhone and iPad. The app lets you bedazzle your photos and videos with a staggering array of transforms, overlays, and filters. It also comes with several video editing features, including one that lets you join several video clips to each other, in order to create one longer narrative. So far, so Vine. The biggest difference is in length, though. Single video clips can be up to 30 minutes long, with the product being up to 60 minutes in length. 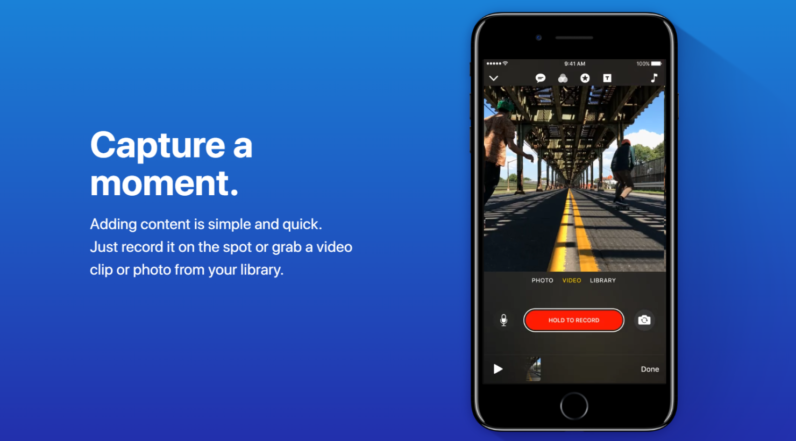 Clips lets you share your content to any app, although unsurprisingly, it nudges you towards using iMessage. According to The Verge’s Lauren Goode, if you create a video featuring people you’ve got in your iMessage contacts, it’ll suggest that you share the clip with them. This is powered by the same facial recognition algorithms found in Apple’s Photos. It’s certainly interesting. Although the lack of a social element baked in means that it may struggle to compete with existing video apps that already have a flourishing userbase.